A passion project like no other, Wild Love Preserve is the sort of place that helps us all regain a little faith in humanity. This Idaho wild horse sanctuary has an astonishing story behind it and is doing incredible work each and every day to preserve dozens of the Gem State's most precious gems: its horses. 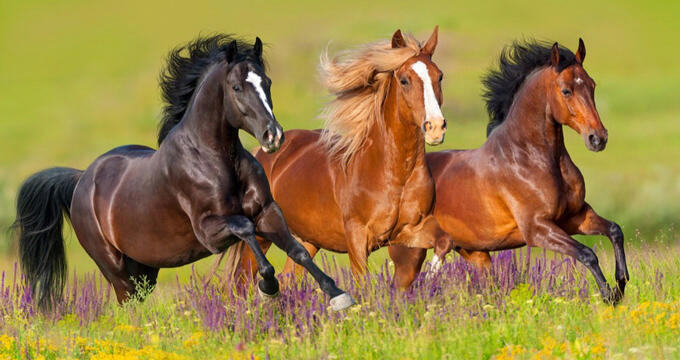 Located in Challis, Idaho, this sanctuary is an amazing project and a truly magical place for any horse lovers, nature enthusiasts, or people who care about conservation and preserving the beauty and natural heritage of the United States. Wild Love Preserve's story begins in Challis, Idaho, in 2010. The area is one of outstanding natural beauty, with the world famous White Cloud mountains and vast, sweeping plains all around. It's a beautiful sight from every angle and a fine example of the beauty for which Idaho has become known over the years. It's also home to one of Idaho's six Herd Management Areas (HMA). Essentially, a HMA is a stretch of land under the supervision of the Bureau of Land Management. These areas are designated as homes for wild horses, but when the populations get too high, 'helicopter roundups' are used to capture horses and sell them off to cut the population down to size. Seeing this and wishing to do something about it, the Wild Love Preserve founder, Andrea Maki, decided to act. In the years that have followed, her work has saved countless horses in the Challis area and she has also worked around the rest of the state, proposing an effective, sustainable model that everyone agree for the other HMAs across Idaho. Essentially, Maki has saved countless horses, allowing them to live freely as nature intended, roaming the plains and running free, rather than being captured, cooped up, and shipped off somewhere else. It was a big job for Andrea, with lots of conflicting interests present in the HMA. Local ranchers need their own land to earn a living, the state had its own interests, and the Bureau of Land Management also had its own reasons to keep the wild horse populations down and organize the regular roundups. Maki knew that pleasing all of these different parties would be an ambitious undertaking, but her love for the horses and her passion for preservation drove her on. In 2012, she decided to adopt every single horse that had been captured in that year's roundup. She used money that had been raised through donations, fundraisers, and grants. From there, she was able to keep all of these horses on their homeland and in familiar surroundings on the Wild Love Preserve, reuniting families that might have been broken up and giving all of these majestic animals another chance at life. Each day, Maki's work continues as she supplies water and food for the dozens of horses she saved. Andrea Maki has done incredible work with the Wild Love Preserve so far, and the fight for wild horse freedom continues every single day. If you're interested in supporting this noble cause and helping to save more wild lives in the future, as well as helping to care for the more than 100 horses saved in the 2012 roundup, there are a couple of ways you can do so. Wild Love Preserve relies on donations and grants to survive, dependent on the kindness and good hearts of people who care about animals and nature. You can make a donation of any size via the official Wild Love Preserve website, and even the smallest amounts count and can be a big help in supplying food, water, and other essentials to the horses each and every day. Your kindly donated money will go a long way to helping with the wonderful work Andrea does to provide the best standards of living for every single horse in her care.